We offer you three options for using MARA: have a free 30 day trial, use a free licence or purchase a licence from this page. For all options, start by downloading MARA to your iPad. To continue using MARA after the 30 days, you can request a free licence or pay the licence fee at any time within the 30 day period. If you are offered a free licence or you purchase one, data you have saved in MARA will not be lost when you transfer to a licenced version. MARA utilises Filemaker Go, a software platform which many developers (like us with MARA!) use to base their products on. Filemaker Go is free for end users. Go to the Apple app store in your country and download the latest version of Filemaker Go (16, 17 or later versions are most suitable) onto your iPad to start. If your iPad only allows earlier versions of Filemaker, MARA will work, but perhaps without some of the features. Using the Safari browser on your iPad, go to this page and tap the MARA icon as below to download MARA. NOTE: iPads give very little indication that a download has started. Tap the MARA download icon only once to avoid multiple downloads. It may take a minute or two to download. Your iPad will ask you which app to open MARA in. Select Filemaker Go. If this option is not available, check that you have installed Filemaker Go 16 or 17. Then open MARA within Filemaker Go. You will need to create user name, log-in and password to use with MARA. Please make careful note of these including any capitals you have used (intentionally or otherwise), as we can’t get into your i-Pad to help you find them. Return to MARA at any time by opening Filemaker Go and choosing MARA from the list of files on the left. Step 5: If you want to use MARA for more than 30 days, you will need to obtain a licence, as MARA will stop working at the end of this period. You can ask us to give you a free licence or you can buy MARA. 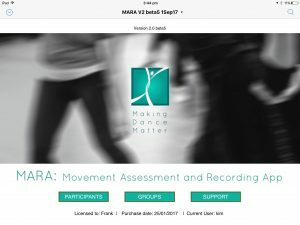 Free licence: Making Dance Matter offers MARA licences for free to students, researchers, dance movement therapists or other professionals working in private practice or non-profit agencies, and agencies themselves. To request your free licence, please email kim@makingdancematter.com.au and tell us about your circumstances and the number of users in your setting. Responses usually within 24 hours. To buy MARA: If you don’t fit in the categories listed above, please make the appropriate Paypal payment, depending on the number of users in your setting. The multiple-user option provides two levels of security, with the licence Administrator controlling access for all other users and able to add or delete individual users. This is ideal for health agencies, to contribute to best practice of security of health records and client data. Then email kim@makingdancematter.com.au who will send you a licence number. You then need to enter this into your full version of MARA to activate it. When your free licence is granted or your payment is received, a licence number will be emailed to you. This should be entered into MARA to activate it. Thank you for trying MARA. If you have any technical difficulties please contact us. This page provides instructions on how to use MARA.